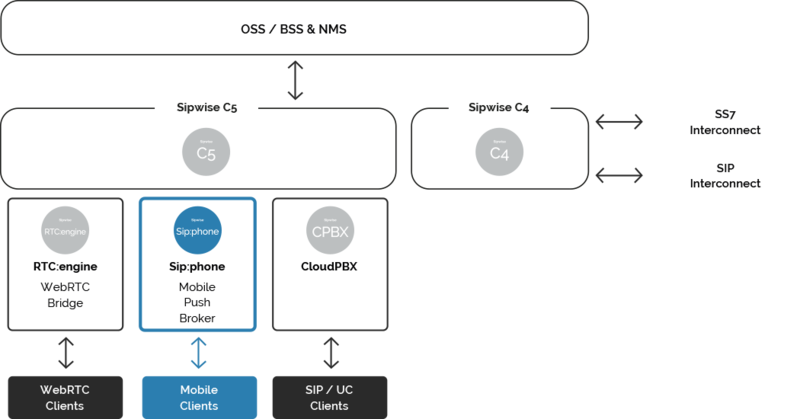 Sip:phone is a mobile application that takes advantage of the capabilities of two Sipwise platforms together: The Class 5 Softswitch and the CPBX. It extends the client’s reachability onto any device that has access to a broadband data connection (e.g. WiFi, 3G, LTE, and DSL), whether it runs on Android or iOS. This allows smartphones’ and tablets’ users to experience voice over IP services. 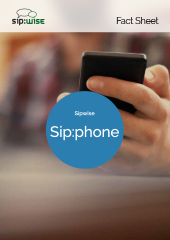 With the Sipwise Sip:phone app, you can use your mobile devices as an extension to your business phone system. It comes white-labelled and can be branded per your company design. The innovative and lean programming connects the smartphones easily and seamlessly to an existing core telephony system, making you reachable anywhere you go. All subscribers are managed and activated directly on the Sipwise C5 using north-bound interfaces (e.g. Web-based interface, REST API). The mobile apps provide web views for users’ self-sign-up pages and are automatically and securely provisioned via activation URLs. These URLs can also be used to verify contact details, as they can be sent to the end customer via SMS or Email. The app starts automatically on tapping these URLs, so no access credentials are ever presented to the end customers. When starting up the mobile app, it synchronizes the end customer’s phone contact list with the Sipwise C5 to find contacts capable of providing instant messaging and presence functionality. The presence status of the contacts is shown alongside the contact list entries of the app, so users can initiate chats (instant messaging) with these contacts. Sip:phone mobile app uses the standard system notification mechanisms to alert users in case of new incoming chat messages. Sip:phone mobile apps are designed for low power consumption to minimize drain of smart-phone battery power. This is achieved by utilizing specific system mechanisms for real-time apps and equipping the apps with the Mobile Push Module of our Sipwise C5 switch. This approach allows to launch the mobile app on the user’s phone via Sipwise C5 if a phone call or chat message comes in. This is achieved by using the push notification framework of the smart-phone’s respective App Store. 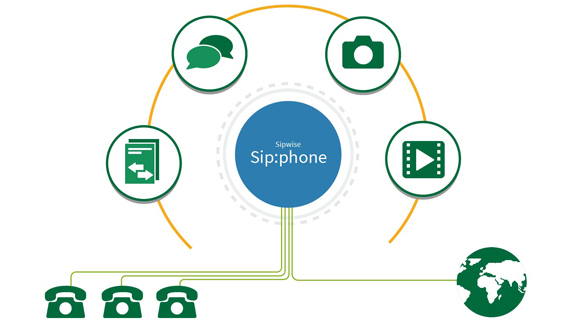 Our Sip:phone mobile app provides a wide range of voice codecs from narrow-band to HD quality for negotiating best voice quality for the available access network (WiFi or 3G). The app user interface and appearance can be fully customized to reflect the operator’s corporate identity. The Sip:phone app can then be placed in the Google and Apple App Stores under the operator’s name and made available to end customers via free or paid App Store downloads as part of the operator’s service offering. Although the Sip:phone mobile app is based on open standards like SIP and XMPP and can therefore work with any soft-switch supporting these protocols, their main use cases rely on XMPP extensions which are typically not available on a soft-switch or XMPP server. To overcome these issues, an operator can simply use the Sipwise C5 as an application server interfacing with the apps on one side as well as any existing Class 5 soft-switch on the other side. If Sipwise C5 acts as an application server, it registers at the Class 5 with the credentials of the existing subscriber of the Class5. Consequently, the app registers at the application server with different credentials. The application server takes care of bridging the mobile apps to the Class 5 and simultaneously concentrates multiple app registrations on the application server to a single registration on the Class 5, reducing potential licensing costs on the Class 5 side.